The move will allow veterans to maintain their emotional connection with the armed forces, allowing them to keep the card they have carried on them throughout their career. Retaining their ID card, known as the MOD Form 90, will also allow service leavers to be identified as veterans quickly and easily, aiding their transition into civilian life. Charities, Veterans UK, which manages armed forces pensions and compensation payments, local authorities and GPs will all benefit from the change, as they will not have to conduct time-consuming checks to identify individual veterans. The Prime Minister last year also announced plans to provide the 2.5 million former armed forces personnel cards which identify them as veterans, in recognition of their service to the nation. Our armed forces give their all to keep this country safe and leaving the military can be an emotional time. 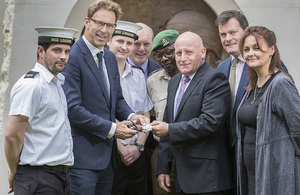 That’s why I’m delighted that people leaving the armed forces will be able to retain that emotional connection with their service by keeping their ID card. Retaining their ID card will also make it easier for veterans to access the many public services which prioritise veterans under the Armed Forces Covenant. So this is a small change that I know will make a big difference. Handing back the Service ID card has regularly been identified as something that members of the armed forces would like to change. Instead of handing back their card to be destroyed on the day of discharge, the corners will now be cut off to show the card is no longer valid. This will ensure that security is maintained at bases and other sensitive sites. Time and time again, I have heard from service leavers that handing back their ID card is one of the hardest things to do as they leave the forces. Leaving the military is an emotionally charged moment and I hope that this change will ease some of those feelings by reinforcing the message to our veterans that they remain a valued member of the armed forces community. The MOD is conducting a major cross-government review of veterans policy and provision, which will inform a new veterans strategy and will be released in the autumn. Part of this involves ensuring greater recognition of veterans so they can efficiently access government and third sector support and allowing retention of the MOD Form 90 ID is the beginning of this. The Ministry of Defence is reviewing a range of other identification options and will make a further announcement later this year. My ID card is more than just a piece of plastic with my photo on, it signifies my service and marks my time in the Armed Forces. Whilst it might seem like something small, keeping my card will make a practical difference by allowing me to verify my service to my GP surgery and local authority.